mReh is a Start-up company from Kraków established to develop and commercialise mobiREH, the first remote rehabilitation system based on the novel combination of wearable sensors and mobile technologies that will allow patients to carry out rehabilitation at home under the supervision of physiotherapists. We are a group of medical doctors, physiotherapists and IT specialists. What is very important – in the process of preparation of our mobile solutions we work together! 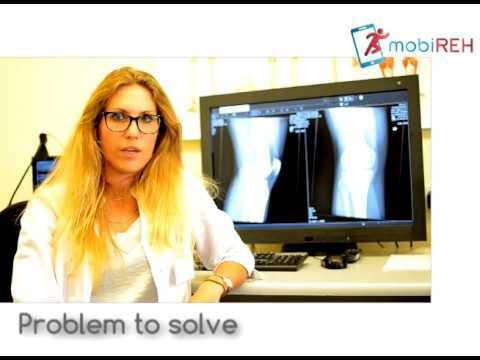 The mobiREH system consists of: Mobile application for patients – it provides access to an individualised rehabilitation programme, prescribed by a physiotherapist, demonstrated in the form of 3D animations. The application is capable of analysing and verifying exercises performed by patients, and providing a real-time feedback, if exercises are not performed correctly. Web platform for specialists and physiotherapy institutions – an IT tool with an extensive exercise database. The platform contains an exercise-editor to create customised therapy plan, as well as it contains other functionalities that allow physiotherapist to analyse the gathered data and monitor exercise compliance and patient’s physiotherapy progress in the therapy. Wearable monitoring sensors – the first set of sensors synchronised with the mobile app is designed for knee injuries. These sensors ensure maximum safety during home-based rehabilitation process by monitoring joint movements and comparing it with the movement patterns in the database. The combination of those elements allows the patient to go home and do physiotherapy being monitored at the same time. mobiREH supports doctors, physiotherapists and institutions in coordination, individualisation and supervision of rehabilitation process of patients. It helps to create sets of exercises, exchange data and educate. The system was built in cooperation between mReh, research institutions and associations (Institute of Physiotherapy in the Faculty of Health Sciences Jagiellonian University Medical College, AGH University of Science and Technology in Cracow, The University of Physical Education in Cracow). Therefore it provides the highest quality of resources. mReh no tiene ninguna noticia disponible.